One Liner Review: A very indie movie, like the craziness of eraserhead mixed with conspiracy theory. 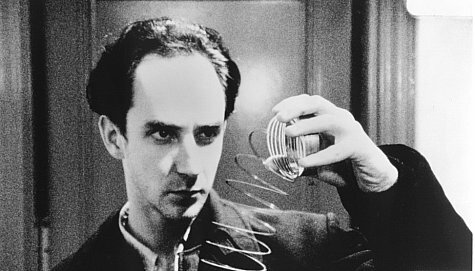 Pi is a strange movie. It’s a film about a man trying to figure out numbers and look for patterns. it’s a movie that wants to be different and finds that uniqueness in a story about different parties who are searching for the way that a number might be a key to things that they have been trying to uncover for years. and it’s about max, a smart man with a curse. numbers come so naturally to him that he can’t get them out of his head. max cohen is a quiet man who lives alone in a tiny new york city apartment. he tries to keep to himself as much as possible and is paranoid about the world. but he has a gift and he kind of likes to show it off. so he allows his little girl neighbor to ask him difficult math problems and he instantly comes up with the answers. she uses a calculator to check that he’s right. those moments are cute and fun and they are meant to give max a little playfulness. but then the real story starts. Max has a woman calling him, trying to get him to do a job for her. he’s not interested. and then when he goes to a coffee shop to sit down and unwind and get away from his apartment, a hasidic jew named lenny meyer sits down next to him and starts talking about the torah. lenny shows max how in the hebrew language, every letter has a numerical value. then he shows max how whole words gets assigned a numerical value and how that value actually means something. so for example the value for child is equal to the value of mother and father combined. all of this is pretty interesting. max leaves the coffee shop to visit his friend, sol, an elderly man who lives in the same building as him. they sit down and play a game called go together, which looks something like othello, but is probably infinitely times more complicated. they talk about numbers. apparently sol used to do something similar to what max does now. he was a mathematician and he was searching for a number and got really close, but then he gave up. max wonders why. Max has theories involving numbers and life. he tells us them through voice over in the beginning of the film and then they are repeated a couple of times as the movie goes on. he believes that numbers are everywhere and can be used to explain everything. he believes that nature can be explained through numbers. it almost feels like something out of the matrix with lines of coding and that coding being composed of numbers. max’s quest is that he is searching for a pattern in the stock market. All of this is in the first half of the movie. it’s enough to intrigue us, even if some of the conversations are a little tough to follow. it is certainly a smart movie and the kind that makes us feel smart while watching it. lenny meyer shows up at the coffee shop a few more times to share some more ideas and theories with max. meyer is searching for a 216 digit number that is found in the torah. he doesn’t know what the number is, but he knows that it’s important. max remembers that sol mentioned looking for a 216 digit number too and he connects the two things together to realize that there is something here worth finding. meanwhile that woman keeps calling max and one day she ever approaches him on the street. she offers a micro chip to him in exchange for something he can do for her. he’s still not interested. this is all pretty tricky stuff, but it is almost meant to be treated like a mcguffin, meaning it doesn’t matter what the microchip does or what max can do for her, we know it is something bad that he doesn’t want to do. Max gets more and more paranoid as the movie goes on, and he starts to lose it. there is a scene where he finds a brain on the stairs of a subway platform. this is blue velvet type stuff, where the character finds a severed ear in a garden. 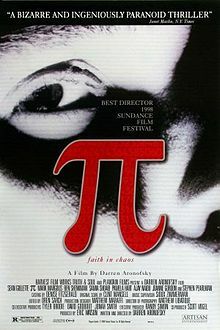 funny because pi is so reminiscent of another david lynch movie, eraserhead, where the main character is confined to his tiny apartment and basically goes crazy in there. tension builds up as the woman comes back after max, this time with men who are working for her and try to attack him. the jewish men also want something from max and believe he knows it. they take him away to see their rabbi and max shows how arrogant he has become claiming that he knows the number and he is the one that has been chosen and that it wasn’t meant for them. this is a very strange movie. it has all of the elements of a conspiracy film with the men in black coats and the lone paranoid man who tries to lock himself away from the world in his apartment. but it is the number ideas that make the movie unique. i’m not sure what this number that everyone’s looking for really does and what it would do for them if they had it, but I’m also not sure that it matters. the movie is interesting in a way that we haven’t seen before. it goes too far out there in it’s second half as the character literally goes crazy, slamming his head into things and doing other motions like that. but up until this point, it’s a pretty good film.